The Traffords of Oughtrington were not closely related to the Traffords of Trafford Park. They trace their ancestry to Richard Leigh of the West Hall of High Legh who was alive in 1484. He married Alice the daughter of John Leycester of Tabley. Their second son, John Leigh, who is known to have been living in 1484 but died before 1569, married Margaret the sole daughter and heiress of William Wylme of Oughtrington. Margaret was buried at Lymm on 10 April 1569. We pick up the tree several generations later to show the family in the 18th and early 19th centuries. John Leigh married Susanna Trafford and their second son, Trafford Leigh, subsequently took the name and arms of Trafford in line with requirement of his uncle's will and thus became Trafford Trafford of Oughtrington. + Anne Shelmerdine, who was buried at Lymme on 15 April 1776. They had six sons and five daughters. + Susanna daughter of Edward Trafford of Liverpool. She was born Aug. 1736, married at Liverpool on 26 April 1762, died 11 Jan 1804 and was buried at Lymme. Susanna was from the Staffordshire branch of the Trafford family, settled at Swithamley, and descended from William Trafford of Whitehall in Cheshire. 3. 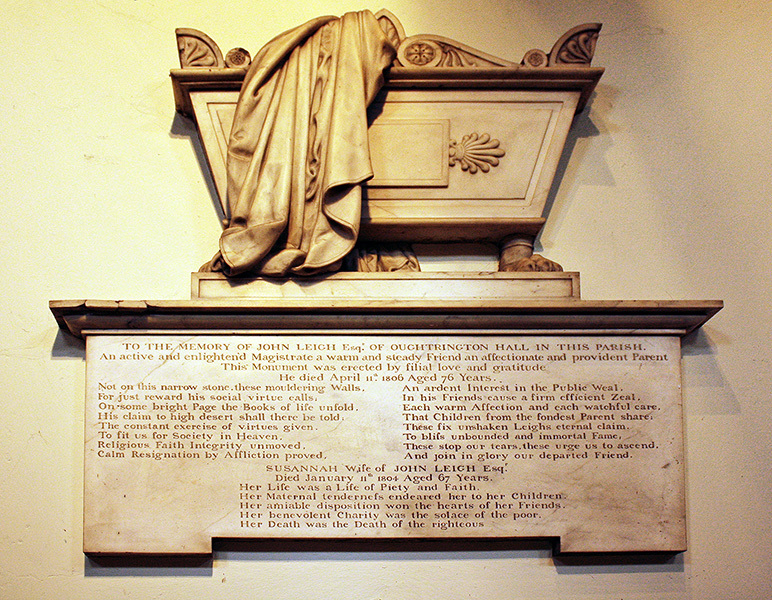 John Leigh, eldest son and heir, born 5 July 1768 and died unmarried 29 June 1800. 3. Trafford Leigh, 2nd son, born 1 Dec 1770 at Oughtrington and baptised at Lymm on 25 Jan 1771. He assumed the name and arms of Trafford only, in pursuance of the will of his uncle, Richard Trafford, by royal sign manual on 5 December 1791, and thus was known as Trafford Trafford. He died at Oughtrington on 18 May 1859, and was buried at Lymm. + Henrietta daughter of Rev. Sir Thomas Broughton of Broughton in Staffordshire and Doddington in Cheshire, at Wybunbury 11 March 1794. They had eight sons and six daughters. 4. John Leigh Trafford, born 1796, died 1814, had one posthumous son who died in infancy. 4. Richard Leigh Trafford of Oughtrington and Middle Temple, county court judge, born 30 April 1800 at Middlewich was the eldest surviving son and heir. He died 27 Jan 1864. + Eliza Frances 2nd daughter of Thomas Tarleton of Bolesworth Castle on 26 April 1832. The couple had seven sons and four daughters. The eldest son was George Trafford. 5. George Trafford of Middle Temple, chief justice of St. Vincent, born Oughtrington on 3 Feb. 1833. + Caroline daughter of Major Creagh on 19 October 1867. 4. Augusta Trafford, 1804-76, unmarried. 4. Henrietta Trafford, 1811, married her cousin the Rev. George Mallory of Mobberley, see below. 4. Caroline, born 3 March, died 4 March 1814. 3. George Edward Leigh, clerk MA, vicar of St. Peter's at Stockport, born 25 July 1772, baptised at Lymm. + Elizabeth dau. of John Philips of Bank in Lancashire, married on 4 June 1798. She died 5 May 1808. They had two sons. 4. Edward Trafford Leigh, Rector of Cheadle who died 1847. 4. George Leigh, MA, born 1806, Rector of Mobberley. He took the name George Mallory on the death of his father-in-law. + 1st wife, Julia Mallory, the heiress of John Houldsworth Mallory, MA, Rector of Mobberley, by whom he had two children. 5. George Mallory, BA, in deacon's orders, died unmarried 8 March 1864. 5. Harriet, born 6 April 1834 and married 1 October 1861 to Rev. Robert Lloyd. + 2nd wife of George Leigh, Henrietta Trafford, the daughter of Trafford Trafford, shown above, who was his cousin. This couple had seven sons and five daughters of whom the eldest, Edward Leigh Mallory, born 4 May 1837, succeeded to the estate. In this way the Mallory name was continued eventually by the descendants of George Leigh and his cousin Henrietta Trafford, and not by the descendants of Julia Mallory. He died April 11 1806 aged 76 years. Susannah, wife of John Leigh Esq. Died January 11 1804, aged 67 years.